October 17 saw the first T20I between Australia and Pakistan being played in Abu Dhabi. The three-match series is being played to determine the winner of the TUC Trophy. A bizarre trophy was unveiled before the start of the series which drew a lot of criticism and saw a lot of fun being poked at the Pakistan Cricket Board and the sponsors. 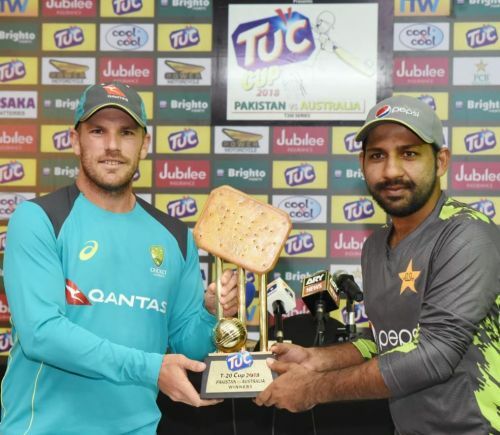 The trophy has a huge TUC biscuit resting on top of three stumps, which makes one wonder if the brand was unsure whether the fans know what the brand is about or not. Whatever the case was, it pulled a lot of eyes and gave TUC some unwanted, but welcomed attention. The trophy is so bizarre that even the International Cricket Council’s official Twitter handle couldn’t help but tweet about the trophy in a humorous way. Once the series began, Pakistan seemed to be in great form and comfortably beat the Australians in the first match after the latter collapsed while batting second. This gave Pakistan a 1-0 lead in the tournament. The Tweet was made to compare the bizarre TUC Trophy to the extremely beautiful ICC Champions Trophy of 2017. Since the Champions Trophy was an ICC staged event, it made full sense for them to compare the two. On Friday, October 26, Pakistan beat Australia in the second match of the series too to seal the series with a 2-0 margin and with one game to go. After winning the series, but even before getting their hands on the trophy, the PCB replied to the ICC’s tweet in an equally humorous manner. The response was in relation to the fact that Pakistan won the trophy that the ICC was comparing the TUC Trophy too by beating India in the final of the ICC Champions Trophy 2017. Now Pakistan has also beaten Australia in the UAE twice to ensure that the TUC Trophy will also be theirs.